Ben, last weekend you turned ONE, and I just cannot wrap my head around it! Seriously...how did this happen?? 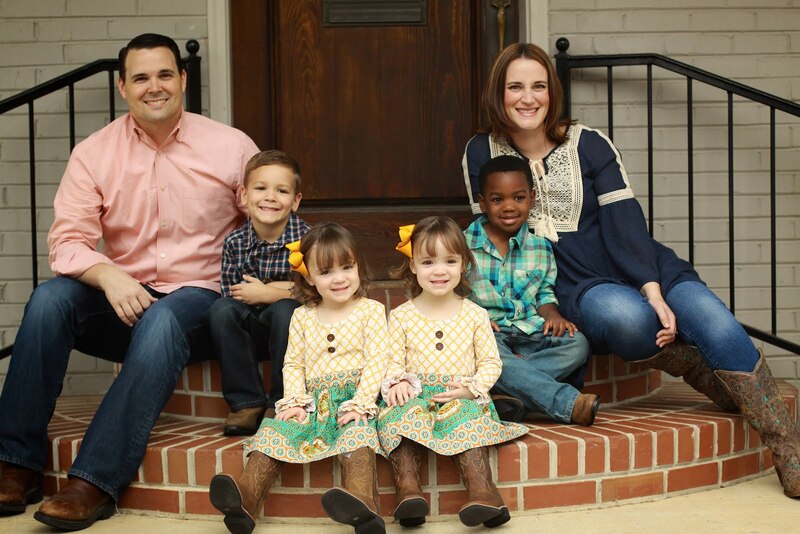 You have brought such joy to our lives, and we love you so very much. Every day you get a little bigger and that fun little personality starts peeking through more and more. We find ourselves laughing at you constantly...and you like to laugh at yourself too! At your one year appointment, you weighed 22 pounds, 7 ounces, and you were 30 inches long. You are definitely a growing boy. You are a human vacuum cleaner and will pretty much eat anything...as long as you don't see something better. If you do, you start throwing the offending food over your shoulder as fast as possible to make room for what you like. You are wearing 12-18 month cloths and taking two naps a day. You did really well transitioning from bottle to sippy cup...although you still really prefer for someone to hold it for you. But you will do it if you have to! Now that you crawl, you are a machine. You have gotten really fast. You also wiggle your bottom side to side as you are crawling when you get really excited. You also think it's hilarious to crawl in circles and to crawl backwards. You love to chase bouncy balls around. And throw the magnets on the fridge. Far. You are pretty obsessed with your daddy. And your brother. And your brother's toys. You have started waving bye bye and saying it, too. You have also started saying Max...but it sounds like Mah because x is hard! Because every day counts. And I apparently got something on my shirt. It's kinda easy to do these days. Oh Mr. Max. You are quite the character. You keep me laughing all day every day...unless you are making me pull my hair out. You have such a funny personality, and you know exactly how you want things done (aka: we are working on your bossy tendencies). You may be a little bossy, but you are also extremely sweet, polite, and hilarious. I just thought I'd write down a few conversations and things that have made me laugh in the past couple of months. Max: Mommy, am I going to school? Max: (sighs) Oh, dang it. Max: We have a package! Max: It's heavy. I need my sweat bands. Max: Oh. I wear my diaper. You love the number 35. We don't know why, but it's the answer to everything. Anything you measure is 35. What time is it? 35. What's my temperature? 35. Speaking of measuring, you love a good tape measure. You pull out the tape and look at the numbers and say, "Hmmm...what time is it?" Chicken "nunnets" and ranch are your favorite meal. You have gone past the word "no" to "never!" I'm sure you got it from a cartoon, but you sound very passionate when you say it. You really emphasize the never...ha! "Max, do you want milk?" It took him a minute or two to warm up to his cupcake, but then he was all over it! How has this sweet boy already been a part of our family for one whole year?? This year has been full of more surprises than we ever knew, and through it all this sweet boy has brought such joy and fun...along with the normal wild times that adding a child to the family can bring! Benjamin, you are truly a delight, and we know you will be keeping us entertained in the coming years. Happy Birthday...we love you so! I mentioned I was getting bigger everyday, and Mike jumped in and said every hour. The bedrest and meds seem to be working, and the babies are weighing in around 5 pounds. The 32nd week of my pregnancy turned out to be a bit more eventful than I had hoped, but it all turned out alright in the end! Such a frightening picture, but I'm just keeping it real here. Hospital life wasn't glamorous! Last Wednesday, 31 weeks 6 days, I started feeling contractions regularly. I started timing and noticed that they were 3-5 minutes apart for over an hour. My doctor had told me that was the magic number, so I called Mike and asked him to come home so I could rest and see if they went away. We went back and forth all evening, but by the time the boys went to sleep we decided we'd better go. We got someone to watch the boys and headed out. By the time we got to the hospital I was feeling pretty silly, because I hadn't felt a single contraction since we got in the car. Still, since we had already made the drive I decided they may as well just hook me up and check me out. Sure enough, when they got me on the monitor it showed I was having regular, strong contractions. That night I ended up getting three shots of terbutaline to help the contractions stop, and they sent me on my way. 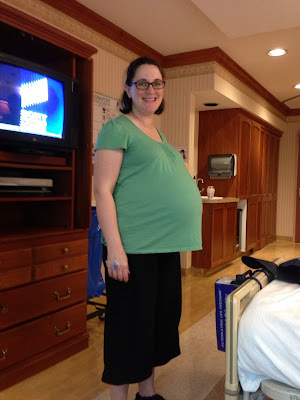 By 11:00 the next morning, 32 weeks to the day, the contractions were starting up again. I was really hoping I was just making them up, but sure enough over the next couple hours they were still there. So, we got the boys settled with our friends and headed back up to the hospital. Sure enough, the contractions were back, and at this point we had to start thinking about more drastic measures to get them to stop as well as what to do if they wouldn't. Since I was still only 32 weeks, the most important thing was for the girls to get steroid shots to help with their lungs. You get the shots over the course of 48 hours, and in the meantime they hook you up to a magnesium IV to help with the contractions. I had already had magnesium one time so I knew what I was getting into. That stuff is the devil's drug. But, you do what you have to do, right? I mean, I'm not going to say I didn't cry a little...ha! Over the next 48 hours I was kind of in a drug induced, can barely keep my eyes open to talk to you daze, but I held out hope that they would magically stop the IV early. I'm not sure why I had that in my head, but I should have given it up. When they came and took the IV and catheter out Saturday night I was so excited! I was still contracting, but it was more like every 10 minutes, which they will take. So...I may have broken down a bit when they woke me up at 3 am Sunday morning and told me the contractions were starting up again so they had to put my magnesium drip and catheter back in. I don't think it was pretty, ya'll. By that afternoon I started to go loopy again, but I prayed that when my doctor showed up Monday morning the magnesium madness would be over. Sure enough, Monday morning, my regular doctor got back from vacation, got me off the magnesium, and got me on a kinder drug. He moved me to the antepartum wing where they could still monitor me but I wasn't as hooked up to all the machines. We pretty much decided we would do what we could to stop the girls from coming early, but we wouldn't go crazy. All of the nurses who stopped by to see how it was going couldn't believe I had been on magnesium for practically 4 days...it was intense. I am thankful to the doctors for keeping these girls safe, but those days are nothing I want to relive! So far the new plan has worked. In fact as of yesterday (Thursday, 33 Weeks) they decided I could go home on bedrest! I am still contracting, but unless they get really strong I think these girls may just hang in there. This whole week their heartbeats and bio-physicals have looked great, and they have handled everything really well. Whew...longest explanation ever, but I like to record everything so I remember. I am thankful to be home with my boys, and we'll see how long these girls stay put!